← 10 things I learned from the Eupho Quartet!! Macross Frontier the Movie: The False Songstress was released in Japan on November 21, 2009, just over a year after the controversial ending of the TV series aired on broadcast television. 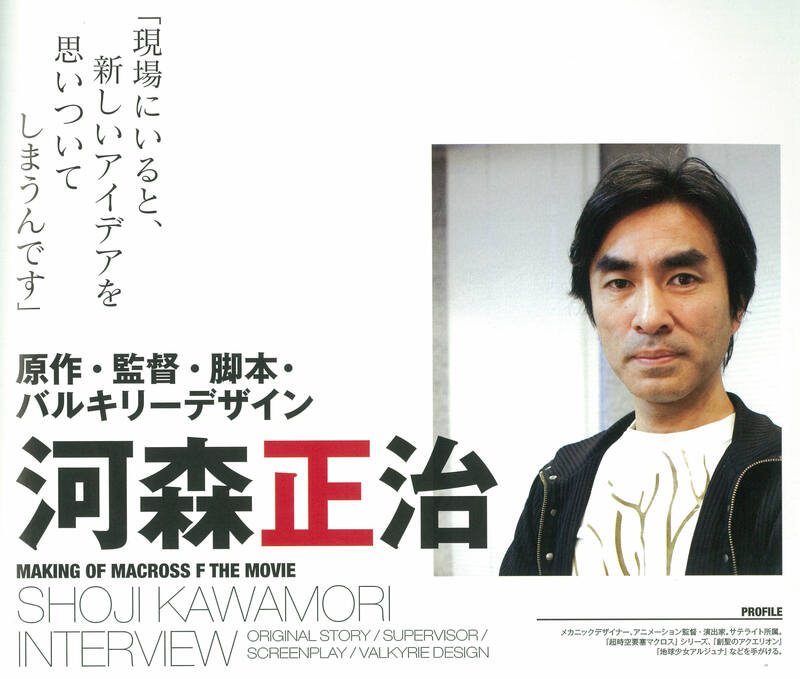 This interview with Kawamori Shōji, who is credited as director, screenwriter and for the original story, comes from the film’s Perfect Triangle guidebook, which was published on December 18, 2009. In it, he talks about the changes and adjustments the film’s staff made and had to make to bring the story of the Vajra war to the screen in this shorter but more elaborate format. Mechanical designer and technical director. Works at Satellite. He has worked on shows like The Super Dimensional Fortress Macross, Genesis of Aquarion and Earth Girl Arjuna. The role of the Director (kantoku) is to take charge of everything at the studio. —This time, the story goes as far as the 7th episode of the TV series, but it seems like the battle scenes include elements from the latter half of the show. Kawamori: In terms of the material we cover, we’ve included things from the second half of the series in this first movie. After all, take Sheryl’s concert—we were a bit afraid that, no matter what we did, it’d like pretty standard. So we tried not to be stingy with the ideas we came up with. The original idea was “the cogs of time.” I personally really like analogue time pieces, so I really wanted to insert that as an element somewhere. —Why did you decide to go with the overall story up to episode 7? Kawamori: Right from the start, I felt that if we were going to rearrange the TV series for the theatre, then it would turn into two movies. And if so, I figured that we could cut it at episode 7, which I had drawn the storyboards for. That’s only one quarter of the entire story, but if we could cram in lots of ideas from the second half of the series as well, I thought it would work. —You were the “Chief Director” for the TV series, but this time, you’ve taken the role of “Director.” And Kikuchi (Yasuhito)-san, who was the director for the series, is now in charge of technical direction. Kawamori: Even though I’m the “Director,” I’m involved in too many other productions to be in the studio permanently, so personally, I’d have preferred to have remained as “Chief Director” (chuckles). This time, we need someone at the studio to give detailed directions for the shots, which are composed of animation and CG scaled-up for the cinema. So I had Kikuchi-san in the studio to do that, and that left me as the director. Since he’s also good at key animation, I think he’s completely qualified for actual directing. But what’s dangerous is that, when I’m at the studio, I find myself coming up with new ideas (chuckles). And that basically means that we might never finish (chuckles). Thanks to all the staff, we were somehow able to get it down. —The storyboards were drawn by five different directors, yourself included (Kawamori, Kikuchi, Abo Takao, Matsuda Kiyoshi and Tanaka Takayuki). How did you decide who would be responsible for which part? Kawamori: I asked each director to take care of the parts that they’d done for the TV series. I took care of the rest: the prologue, Sheryl’s concert and CM Ranka, Alto and Ranka going to Family Mart and taking the tram, and the last section from the concert until the end. Each of them handled something that they are good at, like Kikuchi-san is with dramatic scenes. We also did it in a new, different way from normal. Instead of me as director checking and correcting the storyboards they’d drawn, as far as possible, I asked each of them to do their own retakes. That way, each person’s individuality shines through in their respective parts, and we were also able to come up with lots of interesting ideas. We came up with the idea that various sponsors would commission Ranka to be involved in several commercials: that’s CM Ranka. Based on that, we asked Kanno-san to write songs as if we really were making some TV commercials. —And in this film, we’re also seeing some new Vajra, and the VF-25 Tornado pack makes its debut. Kawamori: One of the things I’ve thought about in regards to the TV series is that, when you change the movement of a 3DCG model, there’s a sense that it doesn’t really feel new. That’s one of the differences between 2D animation and CG. With 2D, if you change a character’s movements, you can tell at a glance that the animation has been changed. But if you do that with CG, the footage doesn’t really look new. Hence, I figured that we had no choice but to bring out new mecha and new Vajra. I think that changing the elements that appear on the screen is a pretty effective way to make something appear new. —When creating a new CG model, do you personally create front, rear and side-view images (for the animator’s reference)? Kawamori: No, if I did draw complete sketches or detailed illustrations, then the 3DCG modeller would make the models without doing much of their own thinking. And if they do that, then there’d be adverse effects, such as the model looking strange from a certain angle. When designing 3DCG models, the artists have to have strong spatial awareness. Hence, with this project, I had detailed discussions with the modellers, and had them all make the models based on rough sketches, bringing out variation through that process. Over many many takes, we polished the models to the point that they look cool no matter what angle you’re looking at them from. Because we were also thinking about shifting towards design using digital elements from here on out, we went through a lot of trial and error this time. I really like factories. 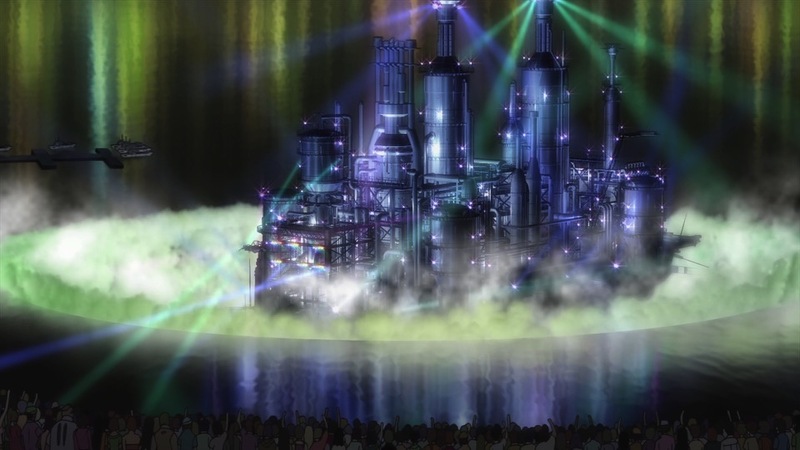 We really had a lot of trouble deciding on where to hold the concert at the end, but then we figured that it’d be interesting if we had a factory in the form of a sailing ship. So we ended up with quite a dynamic set piece. —So all the various CG movements are also new. Kawamori: As the successive generations of Macross have evolved, we’ve wanted to increase the speed of all the movement. But this time, we deliberately slowed it down, because we realised that viewers would not be able to keep up. In terms of my own perception of the speed of movement, I wanted to make it all 1.5 to 2 times faster (chuckles). —I’d like to ask about all of the characters, really, but let’s just focus on the three mains. Are the relationships between Alto and Ranka, and between Ranka and Sheryl, different from the TV series? Kawamori: This time, the story starts with Alto and Ranka already knowing each other. Ranka is starting to fall for him, but Alto is completely unaware of her feelings…that’s how close they are. There are a few reasons behind this. First, if we had to depict all the first encounters between the three main characters, there’d be too much material to cover in just one movie. In order to make the film accessible to those coming to Macross Frontier for the first time, we made Sheryl the only one that the other two would be meeting for the first time. 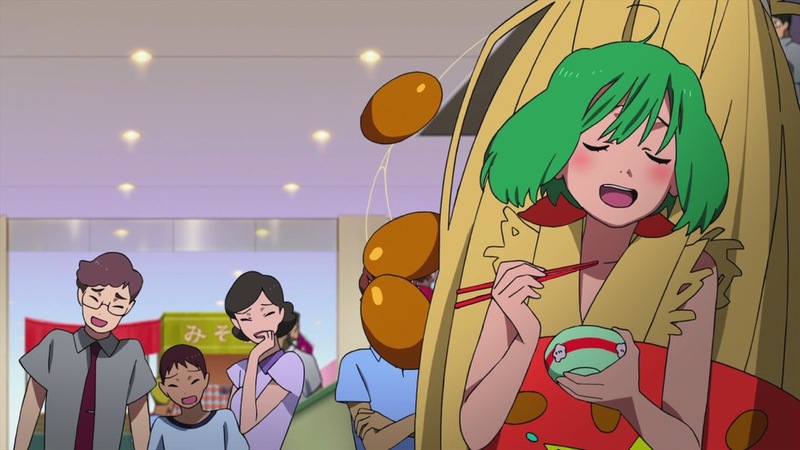 Other than that, don’t you think Ranka’s voice actress and singer, Nakajima Megumi-san, has also grown a lot compared to how she was in the TV series two years ago? So we made both Alto and Ranka more mature mentally, by about 1.5-2 years. We figured that the characters could begin the movie at the point their TV counterparts were at in the middle to second-half of the series. Those are the two big differences. —Could you tell us what you thought upon seeing The False Songstress completed? Kawamori: Actually, we also worked a lot on the BGM choices. If we used the same music for the same scenes as in the TV series, then it’d be difficult to make it seem fresh. So we did our utmost to change the BGM in the scenes that we thought had worked really well in the TV series. As a result, I think that this film has become a work that will taste completely different even to fans who know the TV series, or are familiar with just the music, depending on the way they watch it. Personally, I also found that the film felt completely different the second time I watched it through. I really hope that you’ll all go to see it multiple times at the cinema. 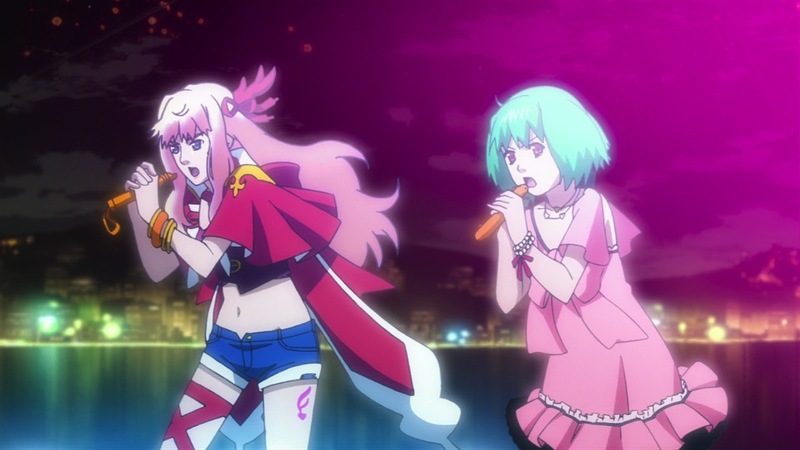 Ranka and Sheryl singing “Lion” in the climax was something that we hadn’t been able to do in the TV series: have the two of them side-by-side on stage. And that’s it for Macross and project posts for the year. As usual, my 12 Days of Christmas series of posts will begin on the day itself, so that all the shows I’ve been watching will have ended before I might have to write about them―we all know that Sound! Euphonium is a lock. But I’ll see if I can squeeze out my mini-“Fall Impressions” posts before then. Hope you’ve all been having a fantastic holiday season so far! This is the 14th post in my “On Anime ‘Writing’“ project, in which I have been looking at how the key staff of producers, directors and screenwriters work together to plan and write the shows that grace our screens. If you liked it, I hope you’ll check the other posts out, too. And feel free to drop me a note or question—whether here, on twitter, tumblr or ask.fm—about any other series that you’re interested in for behind-the-scenes info!